When I was seven years old, I began reading books on the Holocaust. I was both enthralled and disgusted, and I found myself reading book after book about hidden rooms and concentration camps. Around the same time, I began watching the World War II documentaries on the History Channel – squeezing my eyes shut when I saw someone clearly on the verge of starvation, willing the image out of my mind. Looking back on it, perhaps I was a little young to have been reading about the Holocaust. However, I must admire this decision of my parents to allow me to pursue this academic interest through books. While many of my peers were exposed to the “fake” violence of superheroes and video games, I was gaining a “real” understanding, as well as a healthy fear, of the violence that stems from hate. At one point in time, years later, at my school two Holocaust survivors were invited to speak. I remember sitting through their speeches, but strangely without developing a strong attachment to them. They were elderly and were clearly accustomed speaking to many school groups and their stories did not affect me in any profound way. In college, I met my best friend, who happened to be from Rwanda. For over a year, we did not talk about the genocide – when we talked about her home country, we talked about her family. Sometimes, if we were to stray into social issues, we might talk about religion in Rwanda, the “reconciliation” process which seeks to mend ethnic divides, or sometimes even classism. It wasn’t until over a year into our friendship that she began to share her story as a child of both a Hutu and Tutsi parents, fleeing into the Congo for refuge, losing track of her older sister (never to be seen again), and hearing the sounds of people starving to death in the woods. I had always had despised genocide, but suddenly, genocide became personal to me. And now, when I see videos of genocide or read news articles, I find myself thinking of my dear friend, of her family – everyday, normal people caught in the midst of hateful chaos. For ardent readers of my blog, some might recognize East Timor from a recent blog post about Indonesia. Indeed, the histories of East Timor and Indonesia are intricately intertwined and the Indonesian government played a large role in the violence. 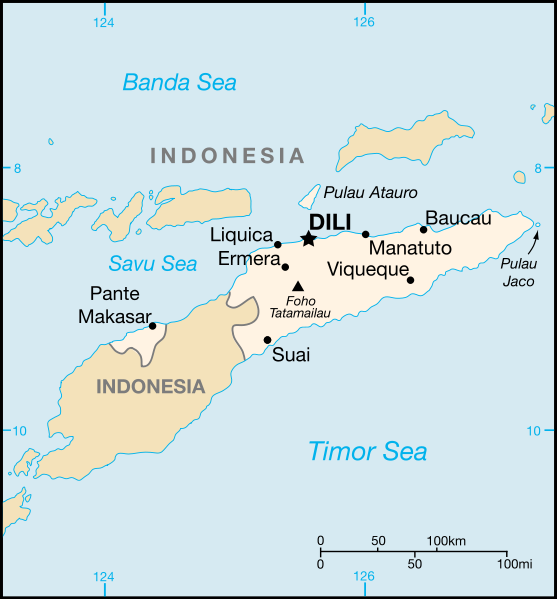 The island of Timor was colonized by two separate powers. The Portuguese took the eastern half of the island and the Dutch took the western half. It is important to note that this was a colonial decision and that there was no division between the peoples of these two separate areas at this political border. Following World War II (in which Timor was a battle ground between the Japanese and Allied troops), the Dutch gave up its territorial claim over the western half and it became a part of Indonesia with the creation of the state in 1949. 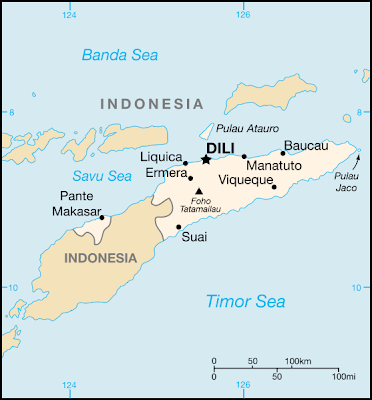 The Portuguese, however, tried to regain eastern Timor as a colony. This proved extremely difficult, however, as the area was damaged extensively by the war and Portugal did not have the financial resources for reconstruction or upkeep. In 1975, East Timor was given the opportunity for independence, however, this was plagued by tension and oftentimes even violence. It was an opportunity in which the Indonesians on the other half of the island tried to take advantage of. The author notes that “Indonesian authorities were quick to portray the 1975 civil war and its aftermath as proof that East Timorese were not ready for independence, but it is clear that the war was fueled as much by the actions of outside parties, especially Indonesia, as by any lack of political maturity on the part of Timorese.” (page 34) The Indonesians took control over East Timor – an action that was not looked on by the international community as a particularly bad thing. Many of the countries (especially Australia) did not want an independent East Timor that could be potentially molded by communist or socialist ideals – a threat that was non-existent under authoritarian leader of Indonesia, General Suharto. For many years, the Indonesians committed terrible atrocities – “kill[ing] one third of the population” (page 49) in the process of controlling the island, as well as establishing concentration camps and widespread starvation among the people. Despite Indonesian rule and the imposition of Indonesian culture, the East Timorese were able to retain their identity. A former colony of Portugal with a large Catholic population, Pope John Paul II brought the East Timor situation to the attention of the international community through his visit to the island in 1989. The aspect which I found the most interesting about this book was the fact that mass murder was actually stopped by the international community – a huge difference from the 1994 genocide in Rwanda. In this case, the UN stood its ground – or rather, the individual workers of the UN did, as they refused to be evacuated. The Catholic Church likewise played a huge role. Perhaps the strongest signal was that of other nations providing ultimatums to Indonesia: “On September 11, the British foreign secretary announced the suspension of British sales of Hawk fighter aircraft to Indonesia, and on September 13, the European Union agreed to a general arms boycott against Indonesia. Perhaps even more surprisingly the Philippines and Malaysia, regional powers that had traditionally refrained from involvement in Indonesia’s “internal affairs,’ indicated their willingness to contribute troops to a UN-sanctioned force.” (page 195) This led Indonesia to, instead of instigating, contributing to the security of the newly-formed nation with the accountability of the international community.